The natural polyester polyhydroxyalkanoate (PHA) is synthesized as an energy storage via thioester exchange reaction in microbial cells. The thermal and mechanical properties of PHA can be varied by modifying the monomeric composition, molecular weight, and chemical modification. 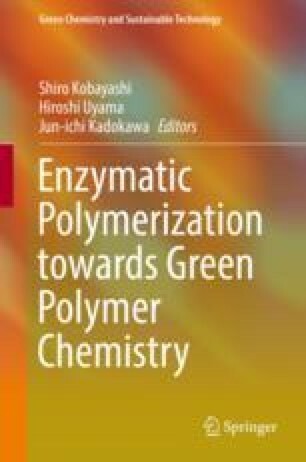 To date, many efforts have been made to understand the polymerization mechanism and industrialization of PHA. PHA synthase (Acyltransferase; EC2.3) is the key player for making stereochemically regulated polyesters. PHA synthase should be one of the most important targets for the synthetic biology of PHA. In 2017, a major breakthrough occurred in the PHA research field, whereby the tertiary structures of two PHA synthases from the class I enzyme have been solved. Based on the crystal structures of the PHA synthases, the detailed reaction mechanism of PHA synthase is discussed in this chapter. Common and unique structural elements are extracted through structure- function relationships between both enzymes. Additionally, function-based studies of PHA synthases are introduced as another milestone. The discovery of a lactate-polymerizing enzyme (LPE) evolved from a PHA synthase is a typical case. The effectiveness of the evolutionary engineering of PHA synthases is demonstrated through case studies including the creation of new polyesters as well as tailor-made PHA production. This work was supported by CREST, JST (JPMJCR12B4 to ST), MIRAI, JST (JPMJMI17EC to AH), A-STEP, JST (29A1027 to TH), as well as APEX Delivering Excellence Grant 2012 (Grant No. : 1002/PBIOLOGI/910322) from Universiti Sains Malaysia.